A couple celebrating their 50th wedding anniversary certainly deserve to celebrate. They have managed to survive a half century of life's ups and downs together. Over that period of time a couple builds a legacy that can't be measured in material possessions, but rather the lives they have touched through their union. Whether you host the party at home, make it an intimate gathering in a restaurant, or decide to throw a large catered event, most of these tips can be used for this very special occasion. You won't have to look too hard to assemble your guest list for the party. The reach of their lives together includes family, friends, work associates, neighbors, fellow church members, community groups, and more. You can either invite as many of them to the celebration as your budget can afford, or keep the guest list to a more intimate number if you believe the couple would prefer a smaller gathering. Before the party, ask guests to submit in writing their favorite memories of the couple. This will also allow participation by those who can't come to the party. Assemble these in the scrapbook as a gift for the couple. Be sure that the venue is accessible for any guests who are mobility-challenged. Even if the guests of honor are hale and hearty, they are likely to have friends and relatives who the years have not treated as well. The traditional symbol for a 50th wedding anniversary is gold, giving you the perfect element for setting a beautiful stage for this party. Here are some ideas for how you can incorporate gold into your party decorations and table settings. Golden paper doilies under plates. Tie golden ropes with tassels around the backs of chairs. Use white china with gold trim. Serve drinks in crystal that has gold accents. Tie napkins with golden ribbon. Light the table with candles in gold candlestick or votive holders. Gather photos from throughout the couple's marriage, and place them on display in golden frames. Write place cards with gold ink. Select a memorable menu for the not-so-newlyweds. This could be a meal based on the menu they shared on their first date. Consider recreating the menu from their wedding day. Or perhaps it can be their favorite meal—only this time they don't have to do the cooking. Keep dietary restrictions in mind so you are offering appropriate choices for those who need them. 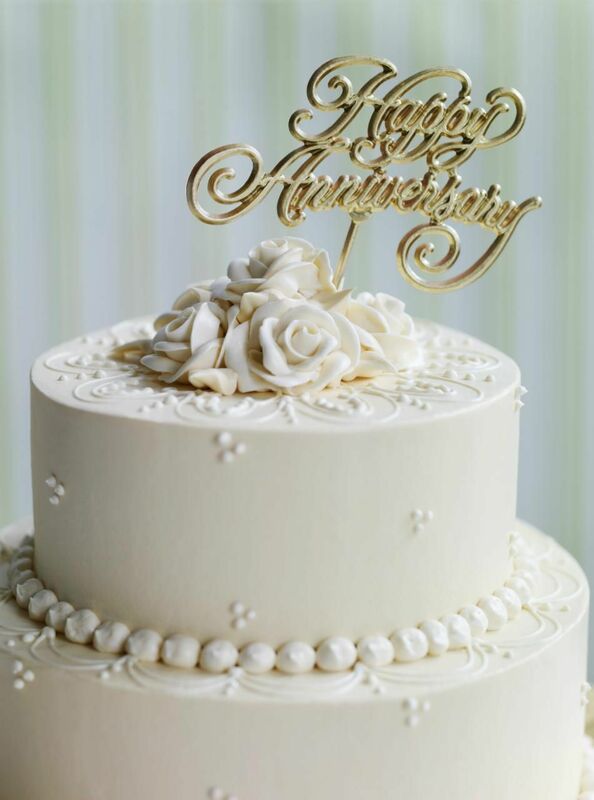 Top the anniversary cake with the topper from their wedding cake if you can sneak it away from them. Otherwise, create a cake topper from golden balls, gold leaves or even golden cupids. Don't forget to toast the guests of honor. You, as host, should have special words to say to them. But encourage everyone to share their fondest memories and wishes with the couple. Coach a person or two in advance to kick things off and break the ice. Have non-alcoholic choices available, such as sparkling cider, so those who do not drink alcohol can still give a festive toast. For musical background, play songs from the decade the couple was married. Alternatively, if their preferences tend toward a different style of music, by all means choose songs according to their taste instead. A high-quality chocolate bar with a wrapper personalized to commemorate the day. A cello bag of chocolates wrapped in gold foil tied with a gold ribbon. A beautiful brocade pouch filled with chocolate wrapped in gold foil that has been tied with a gold tassel. A small, gold tone picture frame with a portrait of the couple. A split of champagne that has been personalized for the event. Decorate each place setting with a mini vase filled with fresh flowers. Preferably the vase will have gold accents. At the end of the party guests can take these home as favors. A current trend is to give a gift to the couple's favorite charity in their name, in lieu of party favors. Give all the guests a small card with a thank you note for attending that informs them of the donation.